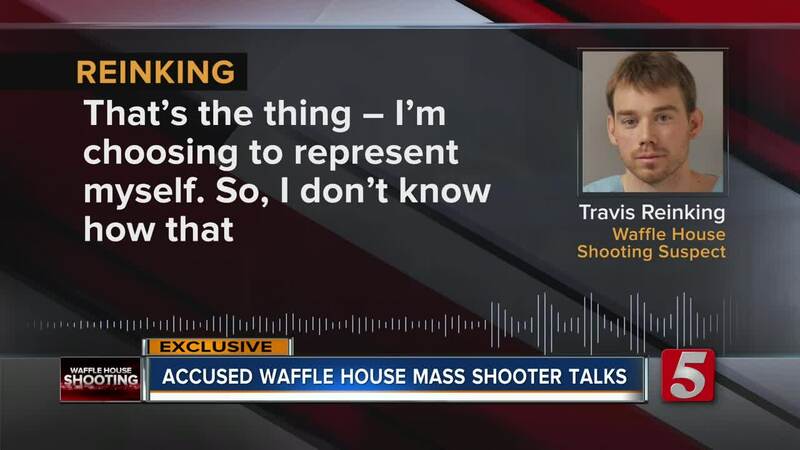 For the first time, accused Waffle House gunman Travis Reinking has broken his silence. Reinking has been accused of murdering four people and injuring four others in a mass shooting at the Antioch restaurant last month. Four people – 29-year-old Taurean Sanderlin, of Goodlettsville; 20-year-old Joe Perez, of Nashville; 21-year-old DeEbony Groves, of Gallatin; and 23-year-old Akilah DaSilva, of Antioch – were killed. Reinking was arrested the next day after a massive manhunt, booked into the jail, and then he decided he wanted to talk. He's locked up and undergoing a mental evaluation. Is he crazy? In an exclusive interview, Reinking breaks his silence about his case. He called NewsChannel 5 reporter Nick Beres from maximum security at the Davidson County Jail. Reinking wanted to talk about his case, his mental health and his lawyers. "About what I'm thinking and what I, I'd like to say on my behalf and stuff like that," said Reinking. He is currently undergoing a mental evaluation. In the days after his arrest, Davidson County Sheriff Daron Hall talked about Reinking's behavior and compared him to another accused mass shooter in the jail. That would be Emanuel Samson, who's charged with killed one last year at the Burnette Chapel Church of Christ, also in Antioch. "I would use the word a little bit more normal for this one compared to the Emanuel [Samson] case, as it relates to interaction. That's probably the word that's been used the most," said Sheriff Hall at the time. Since Reinking's arrest, many have wondered if he'll try using the insanity defense. When asked about his mental fitness he said, "Yeah, no… I'm perfectly healthy." As for the shooting at the Waffle House? He wasn't ready to talk about that. "I'd rather not in the setting I'm at right now," said Reinking. But he did talk about his pending criminal case. Reinking currently has two appointed lawyers, but he said he plans to handle his own legal defense. "That's the thing, I'm choosing to represent myself. I don't know how that works. I didn't like those attorneys," said Reinking. He will likely address that at his next court appearance on June 1. Obviously, there were more questions to ask, but Reinking's call time expired. Also, since Reinking talked about the case he now appears to have violated a gag order and could face a contempt charge. So, no more calls are allowed. Reinking remains held on no bond in the Davidson County Jail. 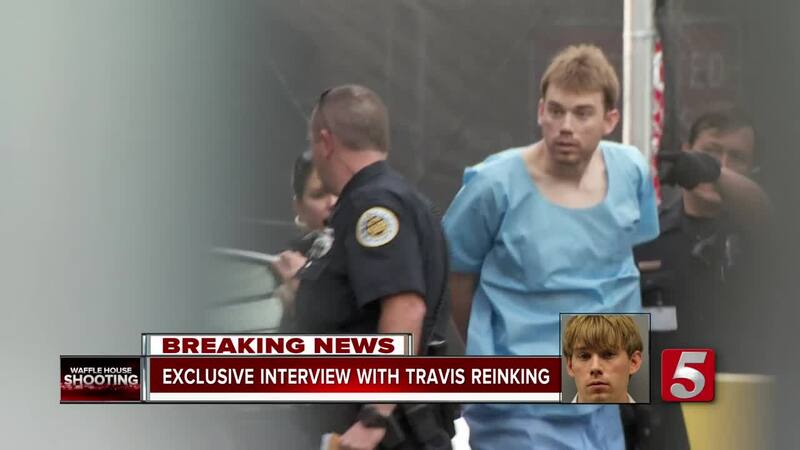 ** Note from Nick Beres: As I’ve said all along I am very careful about the stories I chose to do on accused mass killers. The victims are the ones to be remembered. They are always part of my stories. We will continue to update their progress along with the status of hero James Shaw Jr. But I was afforded the rare opportunity to press the suspect with questions and to get him on the record. What he says is certainly part of the story and could even become part of the criminal case.